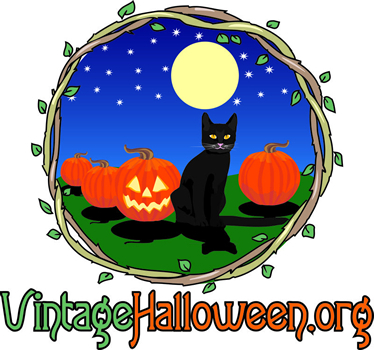 The vintage style Halloween wall decoration shows a black cat conducting a choir of Jack O Lanterns with mice and bats in the audience enjoying the musical performance. 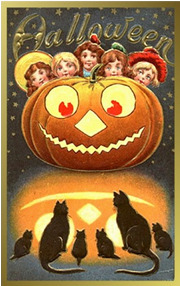 This vintage inspired Halloween wall decoration is created by artist Angelique Duncan of Twilight Faerie. 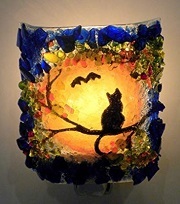 The hanging wall decoration has the wording "Sing a song of Halloween, Pumpkins everywhere Cats and bats and witches are flying through the air." The dimensions of the hanging wall decoration is approximately 8 inches in width and about 9 inches in height with hanger.